Most big-league guitarists vacation in the Caribbean during their time off. Not Mark Tremonti. The Alter Bridge/Creed shredder used his short break from both bands to record a solo album, All I Was, with bassist/guitarist Eric Friedman and drummer Garret Whitlock. Slated for a June release, All I Was sees Tremonti handling lead vocals, and as one might expect, there are guitars a-plenty. You can preview three of the albums cuts, You Waste Your Time, So You're Afraid and The Things I've Seen, below. "You're definitely going to hear an old-school influence, but I won't be sacrificing melodies." Tremonti told MusicRadar last year on the subject of his solo effort. "It'll be a good balance." 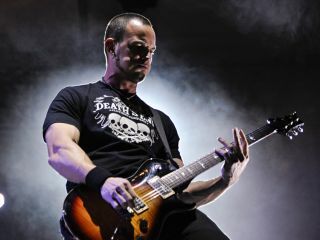 As to how that 'old-school' approach relates to his singing, Tremonti said, "It won't be speed-metal vocals by any stretch. Musically, the riffs might have that vibe for intros, but then the songs will develop in other ways. So they won't be 'speed-metal songs' per se. They'll be heavier than things I've done in the past, but I won't skimp on the melodies."